Fully renovated office for rent in the business center of Nicosia. The office is completely refurbished and it features double glazed windows, central heating, air conditioning, structure cabling Cut 6, TV cable installation, telephone lines for each room. Monthly common expenses €150 approx. (central heating and A/C charges included). No parking space. 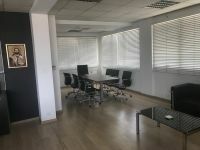 This office in Town Center, Nicosia is being offered for rent (long term) at EUR 850.